Characters as obscure as the ones I've tended to get drawn up often only appeared in one story and/or never displayed their full unobstructed costume in a single image. Correcting that paucity of available reference is one of the reasons this blog exists. However, pulling together a bunch of disparate views to create a whole figure for easy viewing is no mean feat. The two Comicpalooza artists I've turned to repeatedly for good, clean, "style guide" type fully realized figures are Damon Bowie and Jerry Rascoe. Stupidly on my part, despite these guys being perfect for stuff like the sidebar icons on the blog, Bowie was only given one character in 2012 that needed the treatment, and this year he was a no-show (with assistants shilling his prints.) In the case of Jerry Rascoe, I got color figures of B’enn B’urnzz and The Marshal last year, even though both of them had no immediate need for his otherwise very necessary services. For instance, the rough looking biographical entry I threw together for R’es Eda in the early days of the blog was in dire need of Rascoe, and though I regret only getting one piece from the artist this year, I'm glad I got an appropriate personality for him to render. R'es Eda was the villain in the only multi-part Martian Manhunter story of the 1970s. He was said to be J'onn J'onzz's best friend, for whom the Alien Atlas was willing to violently turn on his JLA buddies Superman, Hawkman, Supergirl, and Hawkgirl in pursuit of vengeance for a perceived wrong done to R'es. Unfortunately, R'es Eda was a total backstabber who branded J'onn a traitor to his people and set him up to die in hopes of taking over the Martian government in a military coup. 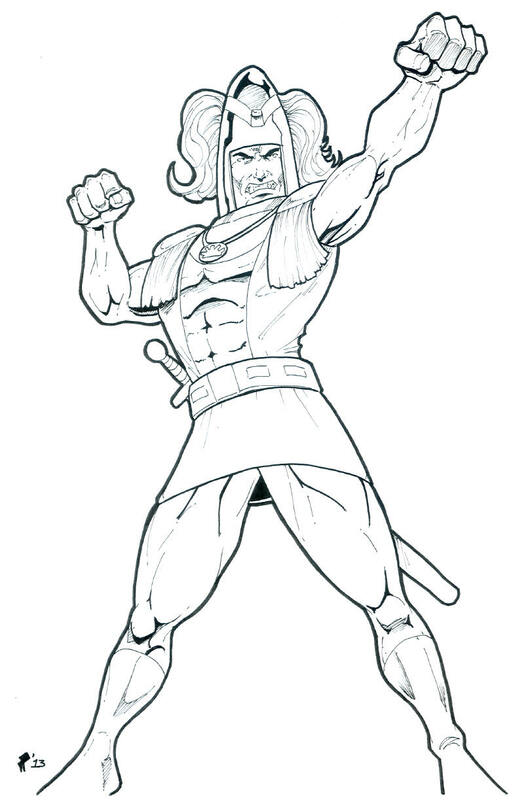 The four part "epic" passed through two sets of creative teams, which saw R'es Eda go through three distinct costume/appearance changes (he initially had hair,) plus his final bad guy duds were drawn with inconsistent details. I explained to Jerry Rascoe these many discrepancies, and loaned him my copy of World's Finest Comics #245 in hopes of his being able to work out a functional hybrid image of the character. That's a lot of work to ask from an artist at a convention, but Rascoe is a champion when it comes to attacking the finer details of a subject, gleefully dissecting such minutia in the spirit of a George Perez. 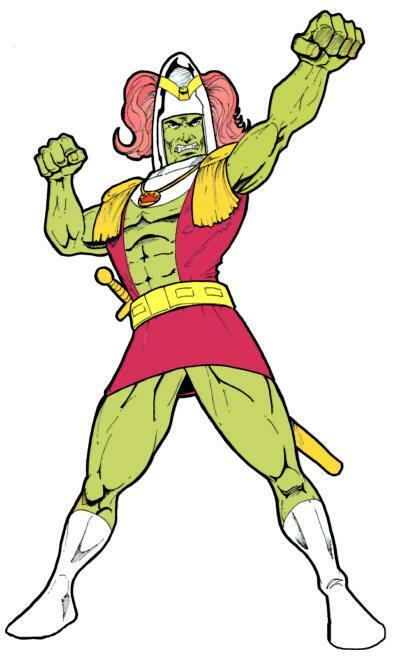 I'm also thankful that he was such a sport about a plainly ridiculous character, since not every artist could get excited about a green Martian wearing a Bulletman helmet with swan details and streaming pink feathers. Rascoe got a kick out of foregoing some of the more conventional alternative versions of the costume (one-piece closed shirt tunic) in favor of the most deliciously gaudy take (open shirt, lounge lizard medallion, manny-skirt, white go-go boots, etc.) that earned the character whatever infamy he can lay claim to. Besides being unexpectedly complex, an artist has got to have a good sense of humor (and probably a fair amount of comfort with their heterosexuality) to be able to appreciate R'es Eda. I knew that I wanted to be able to have options with repurposing a stock R'es Eda figure, especially since I'd excluded him from a lot of Vile Menagerie games because of the lack of quality images on hand. To this end, I asked Rascoe to leave out his usual colors (so that I could do digital tweaks as needed) and to do up a really big figure on 11" x 17" comic board (all the better to recolor and reconfigure when desired.) Rascoe gave me a fantastic rate for the extra duty requested (especially in the face of significant price hikes from about ¾ of returning artists.) Not only did I get a swell piece of art 100% to specifications that allowed me to do another of my (admittedly piss poor) MS Paint jobs, but I got a deal on it to boot! Thanks you Jerry Rascoe, and advanced apologies for all the weirdo characters I'll be hitting you up to draw in the future!